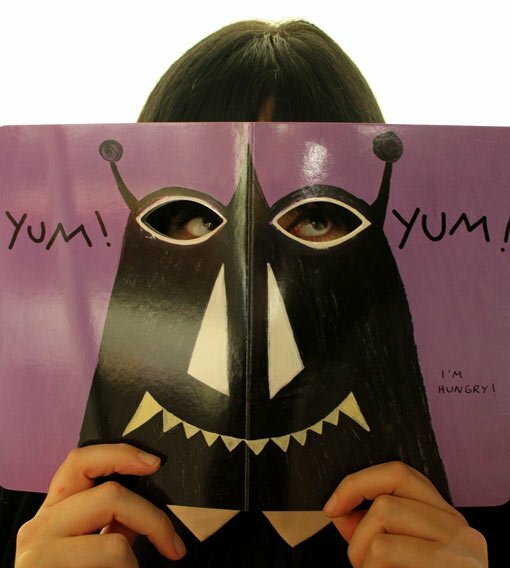 It’s difficult for me to stay calm when recommending Hervé Tullet’s books for children. My enthusiasm hits alarming levels whenever I see the opportunity to share them . I spot strangers in the street pushing multi-story infant buggies full to bursting with adorable jam-faced youngsters and I want to leap out from behind a tree holding a copy of The game of finger worms and say 'You. Must. Read. This. Book. Seriously. THIS book. Now.’ And they will back away because I may have gone manic-eyed and frothy in my eagerness, but the message is clear, right? They need to read the book. And so do you. It’s not just that Tullet’s books are inventive; it’s that they inspire inventiveness. Now I’m not against children using whizzbang technological doodads by any means – let’s face it, I pretty much need instructions from a toddler just to set up a Skype call – but Tullet’s books are interactive in ways that are simple and delightful and so surprising in their effectiveness. 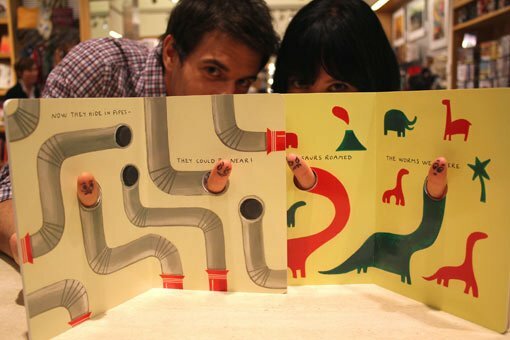 The game of finger worms uses the reader’s own digits to bring the game to life. The eyes game has characters to inhabit like masks. 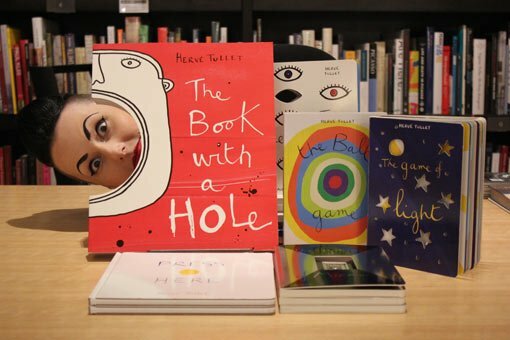 The book with a hole prompts creative colouring and make-believe using the gaping void in the book’s centre. Press here has the reader touching the coloured dots on the page. That’s it. That’s the level of technology we’re talking. Every time they’re read they give a different experience, and they don’t even need to be plugged in! In Press here , the reader follows the instructions to press the coloured dots in different ways through the book. But when you do press the dots and turn the page, the dots have changed. And now you’re a bit startled. What have you done to the dots? HOW did you do it? What happens if you do it again? Because, of course, you do do it again. You shake the book from side to side and turn it around and watch the dots grow bigger and change colour and you press more of them and watch what happens and yes, there is a sense that you’re being slightly ridiculous about all this, standing in the kid’s book section, grinning fiercely and jabbing at page after page and perhaps you should let an actual child have a go, but Tullet quite clearly wants it to be ridiculous and joyful and frantic and fun, after all this is an author who names his books things like The book with a hole which is obviously an invitation to perform silliness with gusto, so you are doing absolutely the right thing by the author by standing there – actively, physically, JUBILANTLY! – reading a book, out in public with your imagination showing. When the reader has closed the last page, calmed themselves and passed the book over to the youngsters, they may be pleased to learn that Hervé Tullet has written a whole range of such glorious books that are stocked at the Gallery Shop, and that one of them – The game of light – even ventures into the realms of ultramodern hi-tech doohickeys: it’s played with a torch! Just remember to give the kids a go when you’re finished.